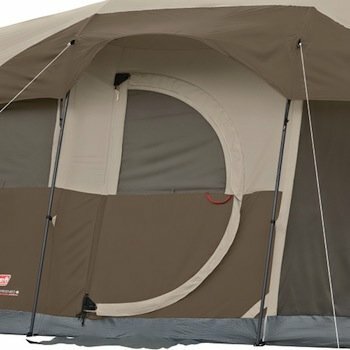 Watch nature unfold before your eyes in Coleman WeatherMaster 6-Person Tent with Screen Room. During the day, the screen room lets you enjoy the great outdoors away from bugs and can be used on warmer nights for extra sleeping space. If it rains, this tent keeps you dry thanks to WeatherTec technology, which uses a tub-like floor with patented corner welds, protected seams, and a covered zipper to help keep water out. Meanwhile, the strong frame is tested to withstand 35+ mph winds. Additionally, an angled window keeps rain out while allowing for extra air circulation. A hinged door makes for easy coming and going. Setup is simple with snag-free, continuous pole sleeves and a patented pin-and-ring system. Inside, there’s enough room to stretch out on 2 queen-size airbeds, and storage pockets keep small items organized and off the floor. When it’s time to head home, the tent easily packs up into an expandable carry bag with a rip strip for extra storage until you’re off on your next adventure. A patent-pending hinged door provides easy entry and exit, and a touch of at-home convenience. The Coleman WeatherMaster 6 Tent has two rooms and plenty of space for the entire family. Up to six campers can sleep easily inside thanks to the 17-by-nine (W x D) footprint and 6 ft. 10 in. center height. Two doors�including a patent-pending hinged front door�offer easy in-and-out. An additional floor-less screened room provides extra ventilation on warm days, a great place for meals and gathering, rain or shine, and protected storage space.